THIS IS NOT A TEST! Seriously, I mean it. 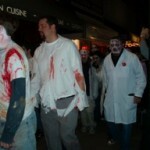 FINALLY the Centers for Disease Control and Prevention (CDC) is addressing the looming zombie apocalypse. Don’t be fooled into thinking this is a PR stunt. No, this is the way you get the news out without causing a nationwide panic. 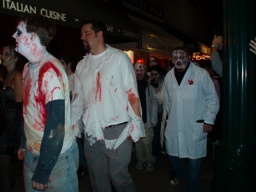 The overt message is that if you are prepared for a zombie apocalypse with emergency supplies and medicines and have a plan for evacuation, temporary shelter and meeting points, you’ll be prepared for anything. The covert message: There’s an apocalypse on the horizon … and who would know this better than the CDC? Maybe they are worried about tomorrow’s “Judgement Day.” More likely they just happen to be in the know regarding upcoming disasters of the viral persuasion. Did this news fall on deaf ears? Hardly. It’s been reported that there was so much traffic, the blogsite crashed. But you can read the entire warning here. OK, one more thing to think about when the horde runs for the exits.